We fell in love with this tiny dual-nation island in the Caribbean over a decade ago. St. Maarten / St. Martin is just 37 square miles and we’ve regularly circumnavigated multiple times on our annual week-long trips there. But despite its small size, we’ve never been bored or had to look too hard for something to do. We’ve had countless conversations with cruise ship passengers who only get a teeny glimpse into all the adventures that are to be had and ask why we stay an entire week and return again and again, so we’ve put together our favorite things to do in Sint Maarten in this guide. This St. Maarten / St. Martin guide includes the following recommendations for what to do in St. Maarten, St. Maarten shore excursions, hotels in Sint Maarten and where to eat in St. Maarten. You can jump to a specific site, activity or restaurant by clicking the links in the table of contents below. Neither Tim or I were scuba dive certified when we visited Saint Maarten (we have since completed our dive certification in The Bahamas). But we wanted to give diving a try and SNUBA lets wanna-be divers get a taste of St. Maarten diving. Instead of wearing your dive tank, the tanks float in a little raft and you are tethered to the raft and your dive buddy with a 20-foot air line. SNUBA allowed us to dive an old shipwreck up to a depth of 20 feet and get a feel for what it would be like to dive. SNUBA lasts about 2 hours total and is great for both cruise passengers and travelers to St. Maarten. Loterie Farm, close to the top of St. Maarten’s highest point Pic Paradis, is home to the Fly Zone Xtreme St Maarten zip line. How can we not do something with extreme in the name? In fact, we love the rush we get from this zip line and obstacle course so much, we’ve done the course on three of our four St. Maarten vacations and it’s one of our very favorite things to do in St Martin. It starts out with a bus ride up the mountain and immediately sends you sailing over the treetops to get your heart immediately racing. The course is a combination of zip lines and obstacle course like crossing rope and plank bridges. You have to work a bit for the thrill of soaring over the rain forest, but this St Martin zip line is one of our favorites in the world. The Fly Zone Xtreme tour leaves Tuesday – Sunday at 10am, 12pm, and 2pm. Closed Mondays. Reservations are not accepted and the course is on a first come first serve basis, so get there early to guarantee your spot. The cost is €60 per person and you must be 18 years or older. The tours lasts 2 hours and you must wear close toed shoes. 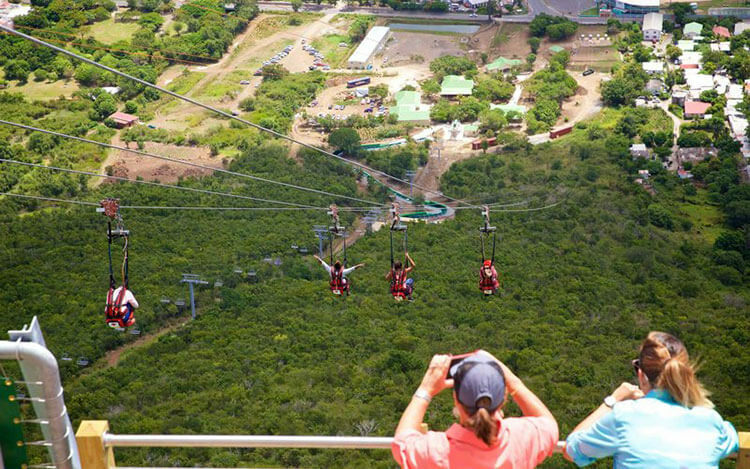 Rainforest Adventures at St. Maarten’s Rockland Estate opened the world’s steepest zip-line in November 2017. Dubbed The Flying Dutchman, the zip-line drops 1050 feet over 2800 feet of cable and is a pure adrenaline rush at 56 miles per hour. You’re taken up to the top of the mountain on the Souliga Sky Explorer, a tranquil 4-person chairlift ride delivering guests to the Crow’s Nest atop Sentry Hill for a 360° panoramic view over all of St. Maarten and stretching to St. Barth’s, Anguilla and Saba. Don’t worry. If zooming back down the mountain on the zip-line at 56 miles per hour isn’t your thing, you don’t have to miss out on the spectacular views. You can still experience the Souliga Sky Explorer with a gentle round-trip ride. 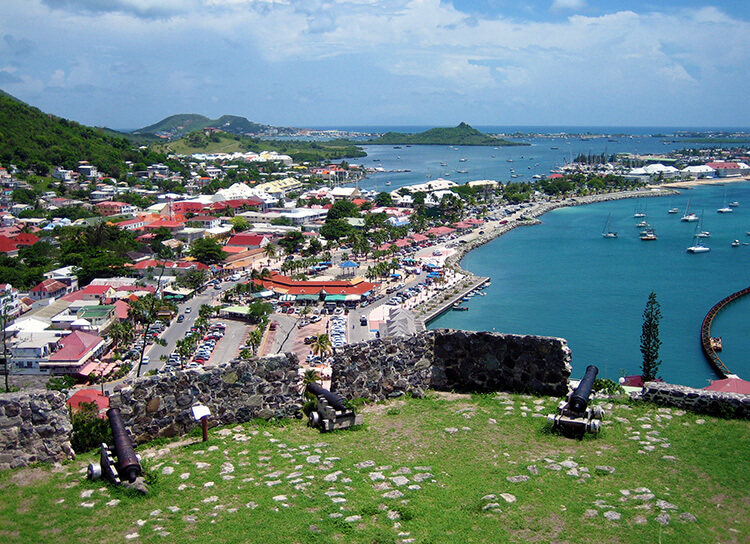 St. Maarten’s largest historical monument is located above Marigot on the leeward side of the island. Originally built in 1767 to defend Marigot and named after France’s crusading king, it now offers visitors that make the steep climb to the top a panoramic view of the island. On a clear day, you can see all the way to Anguilla. To get to Fort Louis, take the steps from the “sous préfecture” car park. Butterflies fluttered above and all around us as we walked through the lush tropical rain forest at The Butterfly Farm. If I was very still, the tropical butterflies would even land on me! Tours of The Butterfly Farm last 15 – 20 minutes and the knowledgable keepers told us all about evolutionary cycle from eggs to caterpillar to eventually becoming a butterfly. 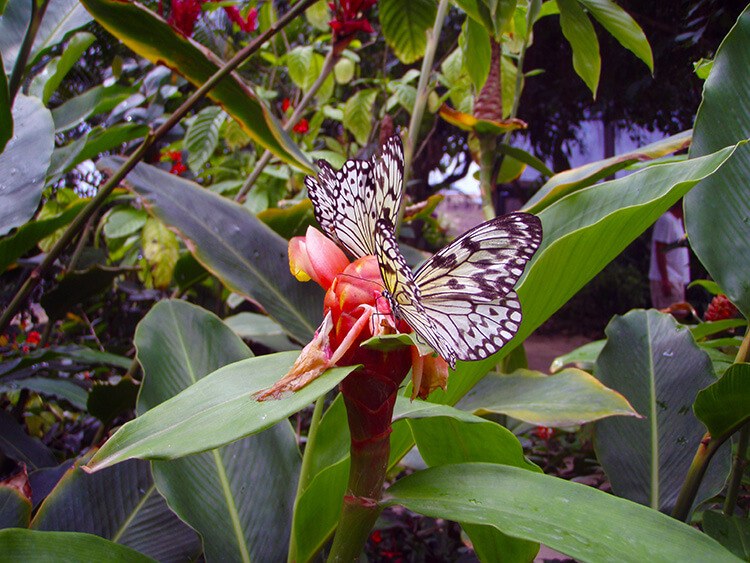 The St Maarten Butterfly Farm is open daily from 9am – 3:30pm. Admission is $15 per person and includes a return visit during your stay on the island. Cruise ship passengers receive a small discount. It’s best to go early in the morning when new born butterflies emerge and flutter around. *Note that the St Maarten Butterfly Farm has been closed since Hurricane Irma. Check their website before you go for information on when and if they will re-open. 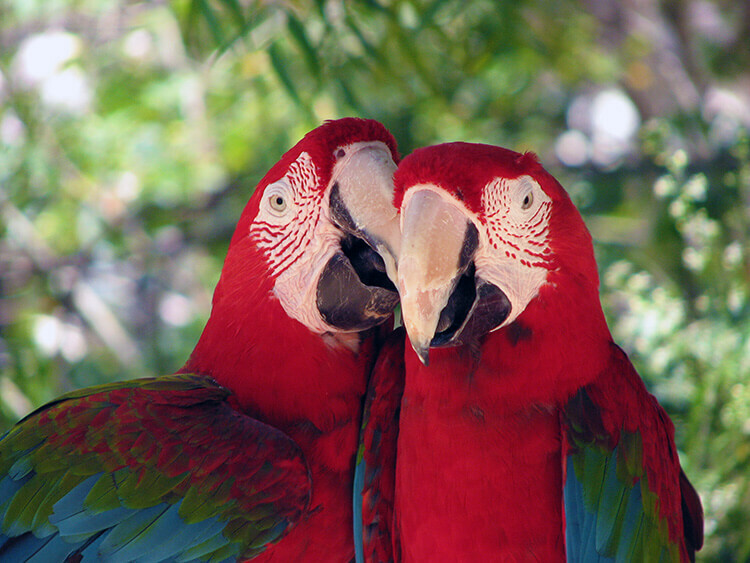 The St. Maarten Zoological Park is the largest in the Caribbean and has a variety of animals, birds, and some local species. Macaws, parrots, and other birds fly freely about and if you pick up some food at the entrance, you might even make a few new friends that will follow you about. The zoo is open daily from 9am – 5pm. Admission is $10 for adults and $5 for children ages 3 – 11. *Note that the St. Maarten Zoological Park was severely damaged in Hurricane Irma, and dozens of rare animals were stolen when the zoo was looted after the hurricane. The St. Maarten Zoo is currently closed and it is uncertain if it will re-open. 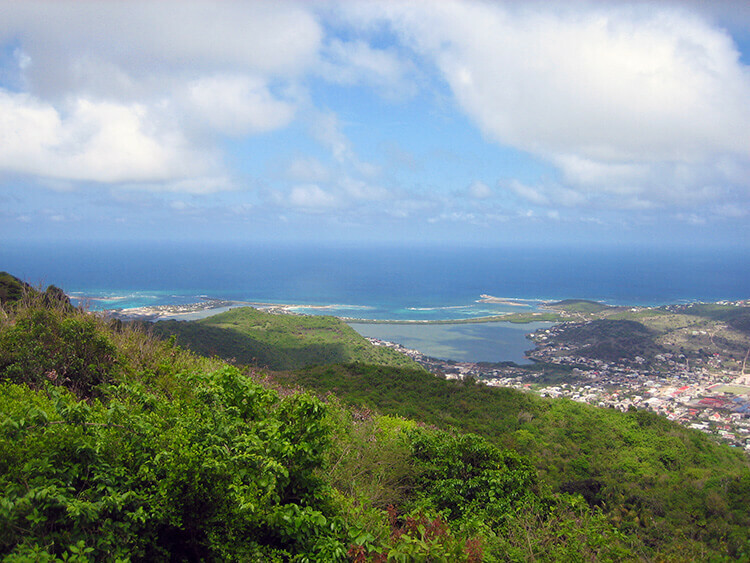 Pic Paradis rises from the center of St. Maarten and is the highest point on the whole island. You can follow the trails from just above Loterie Farm to two observation decks that provide spectacular views over the lush rain forest and the entire island. You might spot some of the wild monkeys that live in the coconut palms. A free hiking map is available from the tourist office. The road to Pic Paradis is just past the turnoff for Columbier. A day sail to Prickly Pear Cay is one of our favorite things to do in St. Maarten. We’ve done the trip out to Prickly Pear Cay four times and we never get tired of it. The boys hoist the sail in the morning; their hard work is rewarded with shots. And we sail the blue waters of the Caribbean as flying fish launch themselves out of the water toward the deserted Prickly Pear Cay off the coast of Anguilla. Some of the best St. Maarten snorkeling is found in the waters around Prickly Pear Cay and a barbecue on the beach hits the spot after a few hours of snorkeling or swimming. The last chore is for the girls to hoist the sail back up before heading back to St. Maarten. Sail to Prickly Pear for the day on Wednesdays and book online. Check-in time is 9am and returns to Simpson Bay around 5pm, so this is not suitable for cruise ship passengers. Passport is required to bring on this St. Maarten day tour. There are plenty of beaches where we found nary another soul in St. Maarten. But Orient Bay isn’t one of them. The island’s busiest – and clothing optional – beach plays host to just about every activity you can imagine. You’ll see people windsurfing, parasailing, snorkeling, riding banana boats, and jet skiing all along the 2-mile stretch of sand. No need to book ahead. Just ask around for the best price to the many vendors along the beach. But if you want to book a jet ski ahead, you can do that here. The legendary liquor of St. Maarten was first made in people’s homes centuries ago and is so cherished that there are even songs and stories about it. Guavaberry liquor is made from oak aged rum, cane sugar, and wild, rare St. Maarten guavaberries only found in the center of the island. The guavaberry world head quarters are located in an old cedar townhouse on Front Street in Philipsburg, which was once the governor’s home. These days the Guavaberry Emporium plays host to tourists looking to sample the sweet and fruity liquor and bring some home. Pinel Island is a little slice of paradise with fantastic snorkeling just a short kayak ride away from the Cul de Sac on the French side of St. Martin. Little ferry boats take people across the small channel, but even with the small amount of tourists that visit, Pinel Island is usually pretty deserted. With your own kayak rental, you can paddle around the island and explore the most secluded beaches on it. Kayaks can be rented for $15 per kayak. Book online and pick up daily at 9:30am. Island hopping to several other islands is easy from St. Maarten. 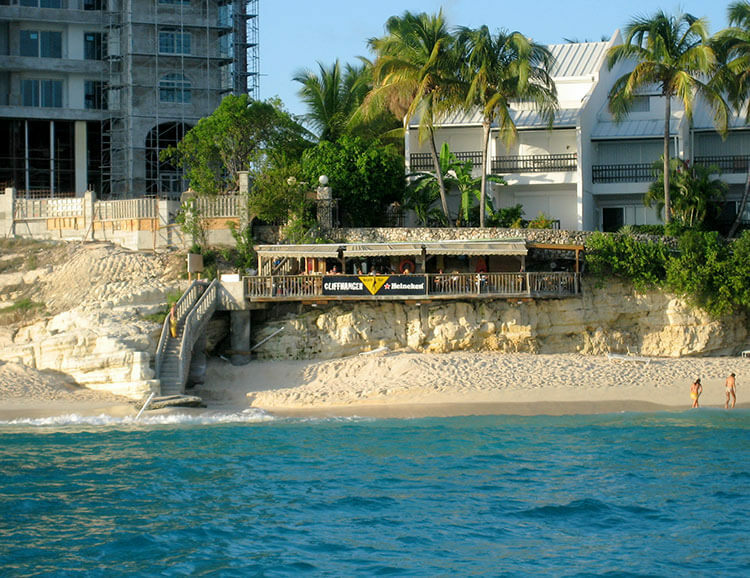 In just 20 minutes, you can reach the nearby island of Anguilla on the ferry from Marigot on the French side. Here you’ll find pristine beaches and far fewer tourists than on St. Maarten since the only way to reach Anguilla is by boat. It’s easy enough to rent a car for the day and go exploring on your own to the many white sand beaches. Check out this guide to Anguilla for more things to do. Saint Maarten is also a popular cruise port of call on many Caribbean cruises. We’ve visited the dual island nation multiple times and have always spent 8-days staying right on Sint Maarten. But we get enough questions from cruise passengers about what they can squeeze in with about eight hours in port. Quite a lot, actually! St. Maarten’s highest point is Pic Paradis and located high in the treetops of the island mountain is Loterie Farm and the Fly Zone Xtreme. It’s a combination zip-line and obstacle course and not for the faint of heart. 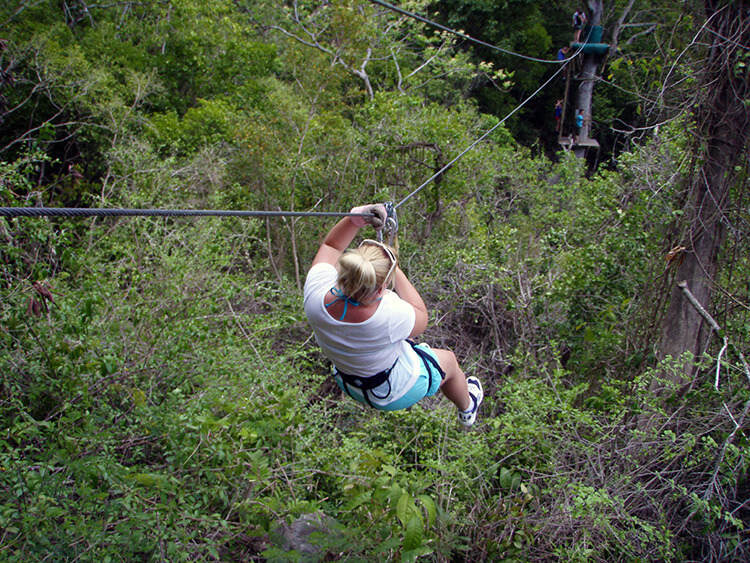 You’ll get a work out on crossing the cables and bridges and a heart pumping adrenaline rush as your soar through the jungle from treetop to treetop. The Fly Zone Xtreme tour leaves Tuesday – Sunday at 10am, 12pm, and 2pm. Closed Mondays. Reservations are not accepted and the course is on a first come first serve basis, so get there early to guarantee your spot. The cost is €60 per person and you must be 18 years or older. The tours lasts 2 hours and you must wear close toed shoes. 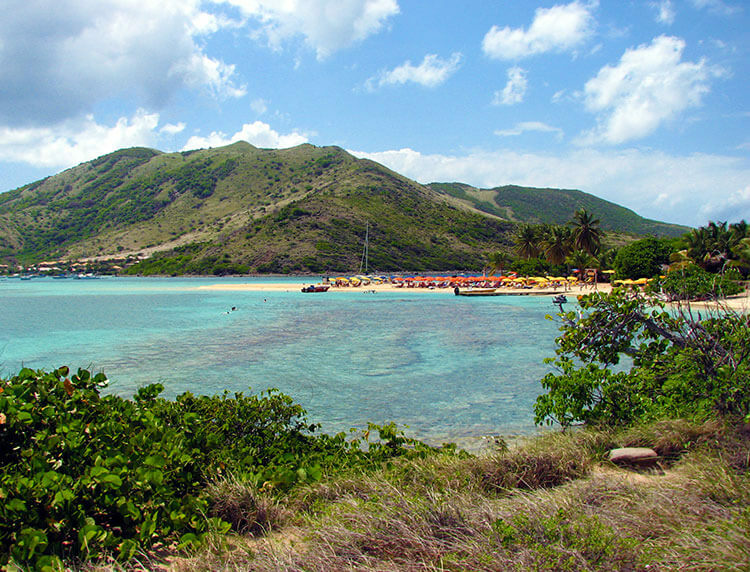 You can hire a taxi for a few hours and cool off at one of the nearby beaches, like Friar’s Bay, before returning for a bit of exploring in Philipsburg. Saint Maarten/Saint Martin is small enough that we typically circumnavigated the entire island several times over the course of our week-long stays. That means that you can cover quite a bit of ground and visit several of the island’s most famous beaches while on your cruise. This half day ATV tour leaves from Philipsburgh, where your ship ports, and you’ll have time to enjoy Orient Beach and Grand Case on the French side. Grand Case is the culinary capital of the Caribbean, where French meets Caribbean cuisine. We promise you’ll never eat so well as in this tiny village. After lunch, you’ll have some time for a little St Maarten shopping in Marigot where you’ll no doubt find the perfect souvenir from the island. 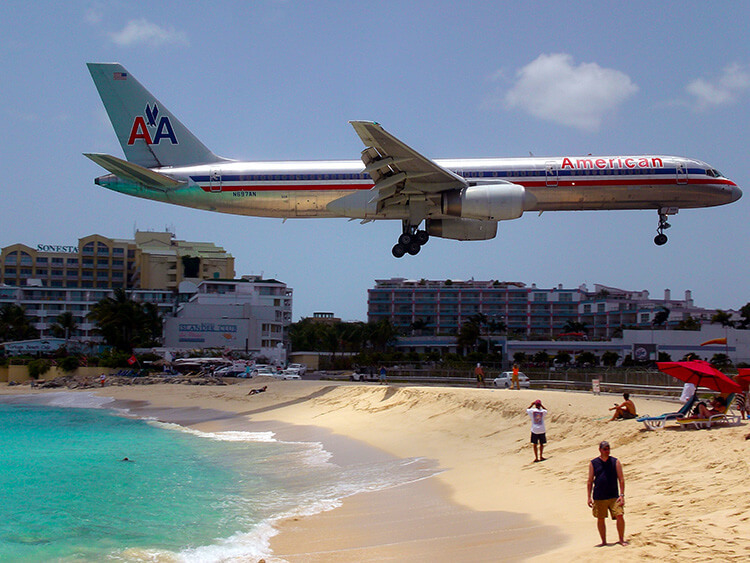 Finish off the tour at one of our favorite spots: Maho Beach. Grab a guavaberry colada and watch the planes land. But we don’t recommend standing in the jet blast unless you want to head back to the ship very, very sandy. If you want to hang out closer to the ship, Philipsburg has many shops to explore as well as a beach (it’s the beach closest to the St. Maarten cruise terminal). 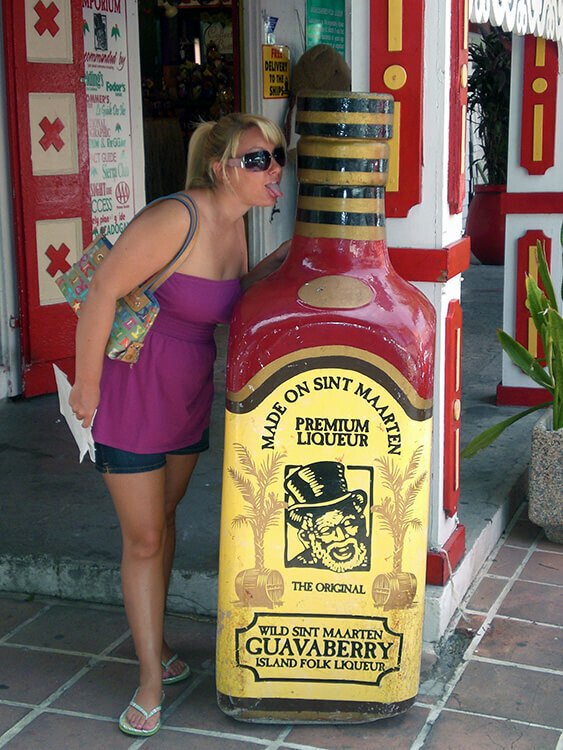 Don’t miss this opportunity to visit the Guavaberry Emporium on Front Street and taste Saint Maarten’s legendary liqueur. Just be sure to check with the ship and know the rules about what quantities of liqueur you can bring back on board if you’re purchasing some as a souvenir. There are a lot of great beach front restaurants in Philipsburg serving up the fresh catch, Caribbean lobster and conch fritters. We particularly like The Greenhouse, which has a lively environment with crab races and live music. Pinel Island is a little slice of heaven just off the Cul de Sac on the French side. There’s a beautiful shallow reef surrounding the island, making it a great spot for snorkeling right from the beach. You can hire a taxi to take you out to the Cul de Sac and rent your kayaks. If you don’t have your own snorkel gear, you can rent that too. 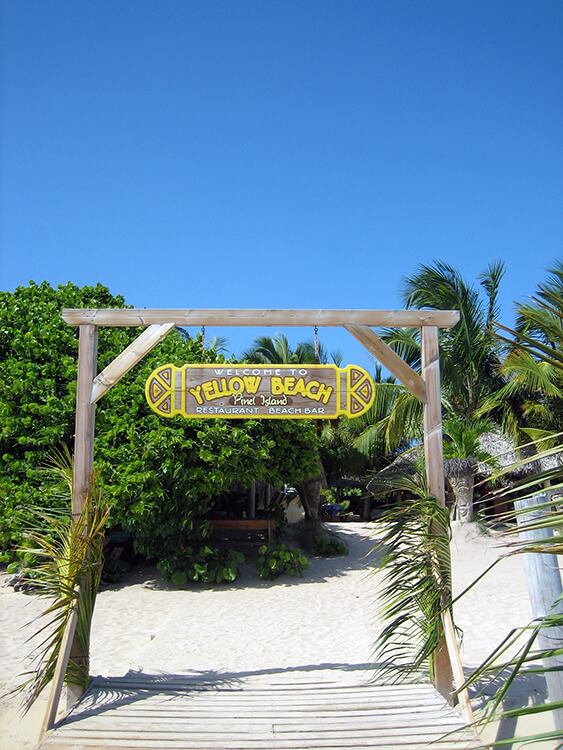 The Yellow Beach Bar on Pinel Islands serves up an incredible lobster lunch from freshly caught Caribbean spiny lobsters. You’ll probably even see the lobster traps set up when you snorkel around the island. Marigot is the French capital of Saint Martin and its streets are lined with chic boutiques and delicious restaurants. We highly recommend stopping at Le Galion for lunch and asking for a table with a view of the port. Don’t miss climbing up to the top of Fort Louis, the island’s largest historical monument. 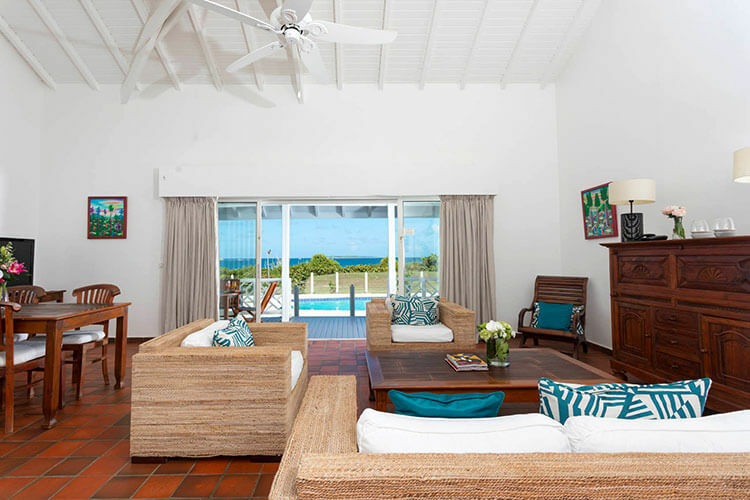 It was built in 1767 and provides a stunning panoramic view over the leeward side of the island. 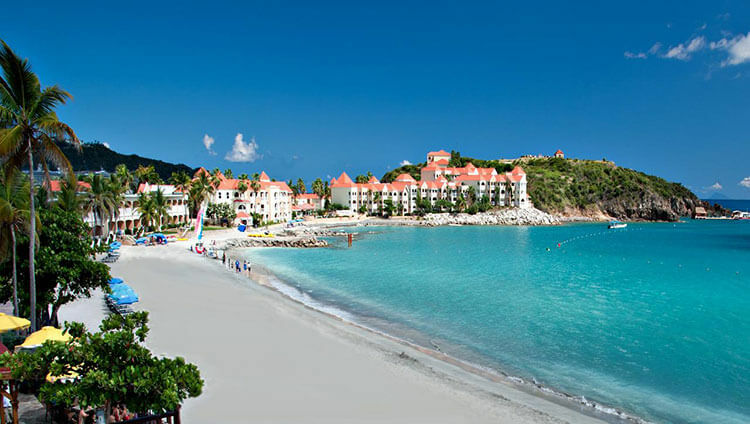 The island of St. Maarten is blessed with over 36 white sandy beaches and we’ve checked nearly all of them our. Here are a few of the ones we think are the best beaches in St. Martin and we never miss going to. Located right at the end of Princess Juliana International Airport, Maho Beach is one of the most popular Sint Maarten beaches because there’s not a beach like it anywhere else in the world. We enjoy the thrill of watching the jumbo jets soar in over our heads. And when the jets get ready to take off, real thrill seekers line up against the fence of the runway to be blasted with a sandstorm from the thrusters. We recommend not getting too close to the fence. Dare devils in recent years have been seriously hurt from the strong jet blast. Happy Bay is still a fairly unknown beach because it is not easily accessible. From the end of Friar’s Bay on the French side of Saint Martin, you take a footpath through the underbrush and walk 15 – 20 minutes to find Happy Bay. Once there, you can’t help but be taken by the beauty of this tropical, intimate bay. It has gorgeous views, a beautiful white, sandy beach and palm trees to provide shade. Take your snorkel gear with you. 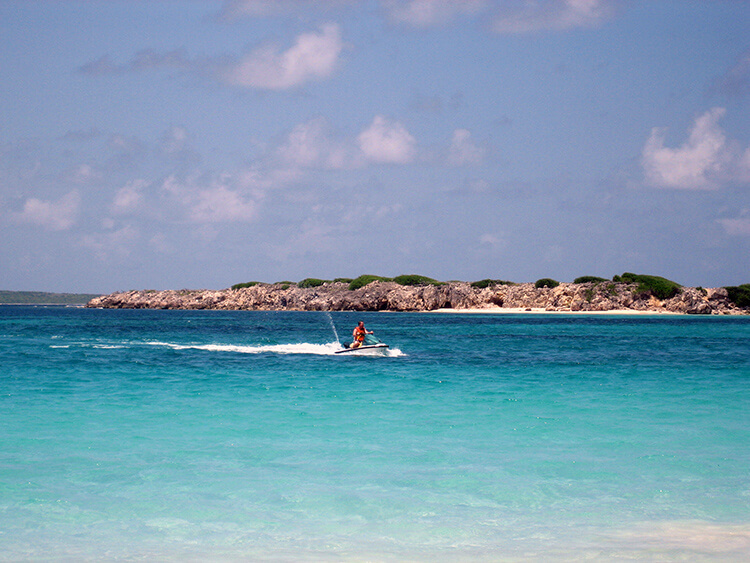 Happy Bay is one of the best snorkel spots on St. Maarten. 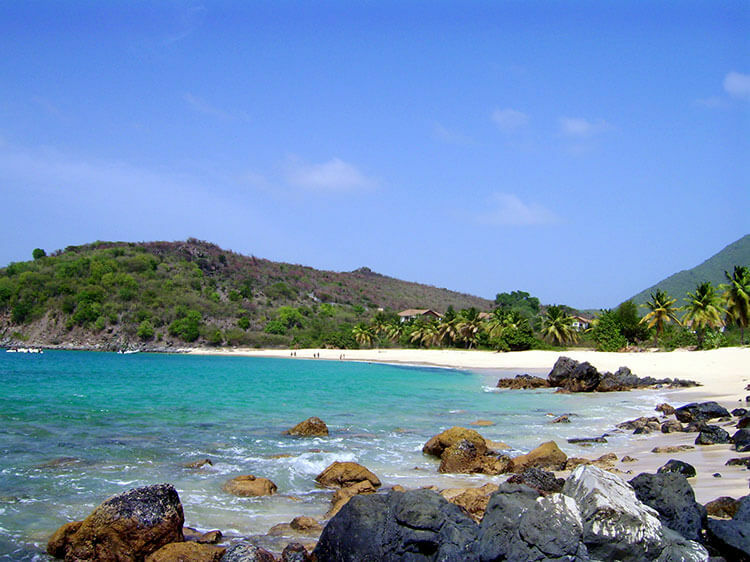 Pinel Island is a tiny island located just 5 minutes from the French Cul de Sac. The end of the road at the French Cul de Sac opens onto a wide sandy area where you find a “ferry station”, a dock and a shack that rents out kayaks and snorkel equipment. Small ferry boats are waiting there to run you over to Pinel Island for a round trip fee of just a couple of dollars. There is a small restaurant that serves up fresh grilled lobsters caught in the traps right in the shallow waters of the beach. 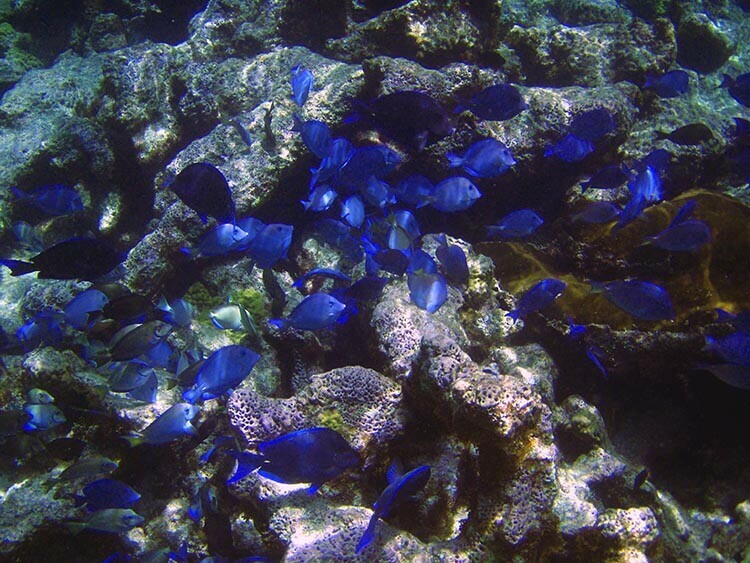 There is also a snorkel trail you can follow to the reefs, so be sure to bring your snorkel gear with you. Orient Bay is the party-loving, clothing-be-damned beach of SXM. Located on the French side of the island, the world famous nudist resort, Club Orient (currently rebuilding after Hurricane Irma), sits at the far end of the beach. Water sports are plentiful here with jet skiing, parasailing, windfurging, banana boats, and even kid’s activities. There is also no shortage of beach shack restaurants serving up fresh fish and tropical drinks. Located on the southern tip of the Dutch side of the island, Cupecoy is a set of three beaches surrounded by limestone cliffs and caves. You can access Cupecoy Beach from the Cliffhanger Bar built right into the cliffs. There are stunning views of the island of Saba from the Cliffhanger. There is a lot of development going on around this area as this side of the island was hit hardest with hurricanes in 1995. When it comes to where to stay and the best hotels in St. Maarten / St. Martin, it can depend on what you’re looking for. Most hotels are located on or very near to St. Maarten beaches. Some beaches, like Orient Beach, are always buzzing with loads of activities, restaurants and nightlife. Others, like Grand Case Beach, are more relaxed and quiet. And regardless of whether you choose to stay on the Dutch or French side of the island, everything is relatively close and very easy to access with a rental car. Some of our favorite hotels that we’ve recommended and stayed at are still undergoing rebuilding efforts post Hurricane Irma. We’ve selected some recommendations and will add more back as more hotels re-open in the future. Belmond La Samanna is one of the best hotels in St Martin, and the 5-star beach resort is regularly ranked as one of the top 10 hotels in the Caribbean. It’s located on the exclusive Baie Longue (Long Beach) just over the French border and a couple of miles from Princess Juliana Airport. The hotel just recently reopened after sustaining quite a bit of damage in Hurricane Irma, but the white-washed villas and buildings reminiscent of the French Mediterranean are back. There’s a total of 83 rooms and suites, in addition to eight 3-bedroom and 4-bedroom villas. You can enjoy fine French cuisine at the resort’s restaurant, Trellis. Wine lovers will also enjoy the resort’s La Cave Wine Cellar, which is the largest private wine cellar in the Caribbean. And the completely renovated beach bar is a top spot for enjoying a St. Maarten sunset. The resort has a spa, tennis courts and a resident tennis pro who offers lessons, and a fitness center offering yoga and pilates. Belmond La Samanna also offers guests complimentary use of non-motorized water sport equipment such as double kayaks, hobby cats and snorkel gear. The concierge can also help guests arrange activities like a champagne sunset cruise, which is definitely one of the most romantic things to do in St. Maarten. Divi Little Bay Resort is nestled between two bays, Little Bay and Great Bay, on the Dutch side of Sint Maarten not too far from Philipsburg. 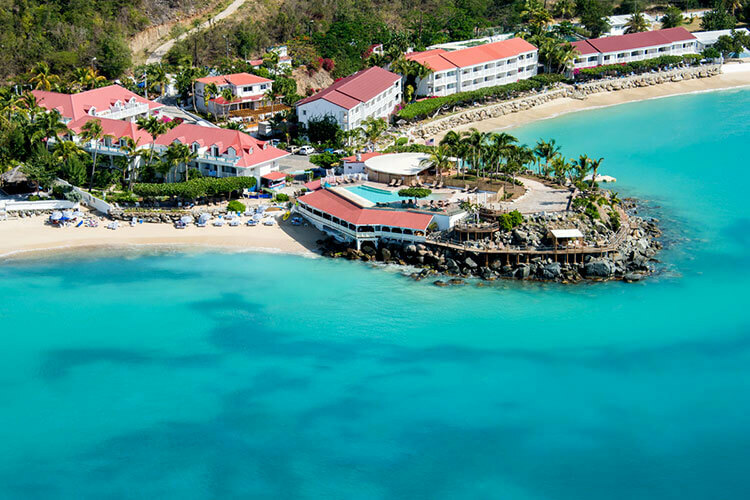 Also severly damaged in Hurricane Irma, the St. Maarten resort resort rebuilt and re-opened in 2018 with quite a few upgrades. You can choose from an all-inclusive package or you can choose room only. The resort’s guest rooms and suites all got a freshening up. All suites have fully equipped kitchens, though the all-inclusive packages include all meals in the resort’s three restaurants. New amenities on the resort include a brand new pool, a brand new pool bar, and a new restaurant called The Shack. The Shack features barbecue and jerk dishes. The main restaurant, Seabreeze, also got an entirely new menu during the renovations. In addition, the resort added an all-new full service spa and a water sports center. There’s also an on-resort dive center and some of the most popular St. Maarten diving sites are located just off of Little Bay Beach and in Great Bay just in front of the resort. With all-inclusive non-motorized water sports like kayaks and catamarans, three pools and family plans where kids under 5 years of age stay and eat free, Divi Little Bary Resort is one of the best places to stay in St. Maarten for families. 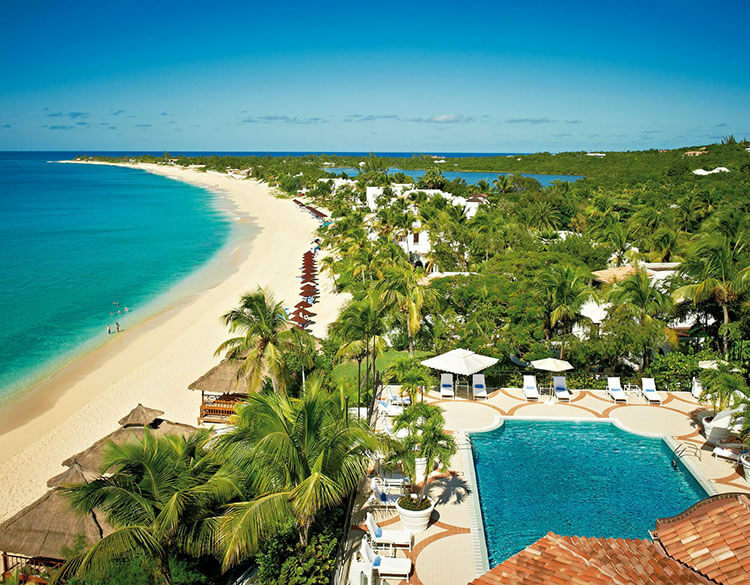 Esmeralda Resort is one of the St Martin island hotels located on Orient Beach on the French side. The resort has a total of 65 rooms that are spread out in 18 luxurious villas, each with it’s own pool. Right on Orient Beach, every activity you could possibly want is practically outside your door. There’s jet-skiing, parasailing, water skiing, wind surfing and boat hire all right on the beach. The resort has their own on-site restaurant, Astrolabe, which specializes in French cuisine with a Caribbean flair. And there are at least six other restaurants all within walking distance strung along Orient Beach. The island’s gastronomic capital, Grand Case, is just a short drive or taxi ride away. Grand Case Beach Club is one of the SXM hotels located on Grand Case Beach in the island’s gastronomic capital on the French side. Unlike the previously mention Belmond and Divi, which are part of larger chains, Grand Case Beach Club is independently owned by locals. The resort was greatly damaged in Hurricane Irma, but has been rebuilding and partially re-opened as of November 2018. They still have ongoing construction currently. The rooms are all spacious apartment-style with fully equipped kitchens from studios to two bedrooms. There’s a pool that overlooks Grand Case Bay and guests have complimentary use of the non-motorized water sports. There’s also a fitness center and spa and massage services are available. There is an onsite restaurant, as well as many excellent restaurants located nearby in Grand Case. Pineapple Pete, named for the restaurant’s proprietor, is a staple on St. Maarten. It’s located in Simpson Bay, just a couple of minutes from the airport and about a 10-minute drive from Marigot. With a fun and lively atmosphere, Pineapple Pete is casual. Come to eat, come to drink or even come to shoot some pool on one of the eight pool tables, throw some darts or play the arcade games in the pool room. Once evening rolls around, you can always expect live music, earning Pineapple Pete’s the award for best live music on the island. The food is excellent with a varied American-Caribbean menu. You’ll find everything from burgers to barbecue. It’s the lobster thermidor that we come for though, and Pineapple Pete is famous all over the island for it. Pineapple Pete is open Tuesday – Sunday from 11am. Who’s ready for 5lb lobsters? The original The Greenhouse Restaurant, located in Bobby’s Marina in Philipsburg, has weathered many storms (literally) and been a fixture of the island’s capital since 1986. It’s another restaurant with a more casual atmosphere and lively scene with crab races. There’s also a second location in Simpson Bay. Both locations have the same menu and The Greenhouse Restaurant is famous for two things: their extended happy hour that runs from 4:30 – 7pm and their lobster mania nights. We always plan to go for lobster mania night, which is on Tuesdays and Fridays, when live Caribbean spiny lobsters are sold starting at $19.99 and are the cheapest on the island. Get there early for a lobster dinner, because the lobsters go fast. 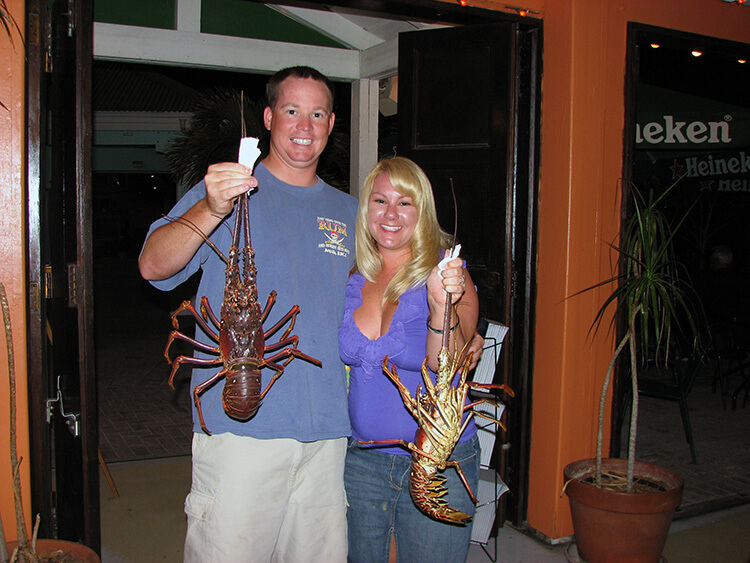 Not only do we head there for the lobster – some weighing in at more than 5 pounds! – but also the fun atmosphere. The Greenhouse is the place to be with crab races, happy hour specials, and live music on Friday nights. The Greenhouse Restaurant is open daily from 11am – 9pm (until 10pm on Fridays). Bamboo Bernie’s, which has moved to Simpson Bay post Hurricane Irma, has been part of the Sint Maarten scene since 2001. 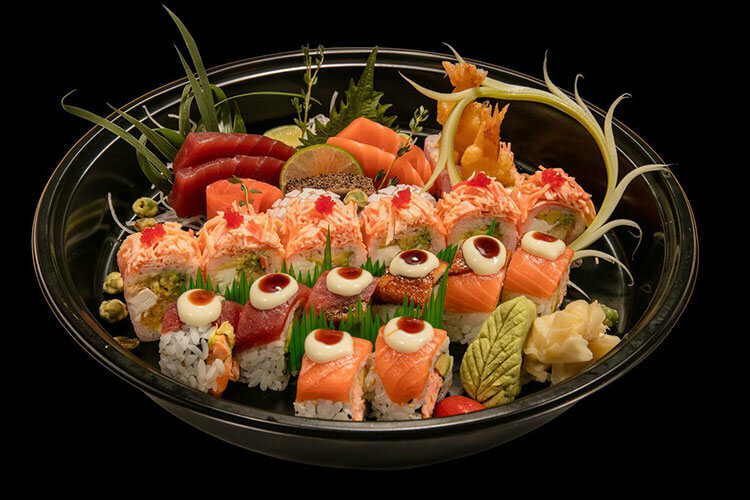 Known for their cocktails and sushi, it’s an upscale sushi bar meets club scene with a DJ spinning. Don’t worry if you’re not in to sushi. Tim isn’t either and there’s also a grill with other Asian-inspired selections. Some of the sushi rolls aren’t traditional either, and you’ll find specialty rolls with things like braised pork belly. Bamboo Bernie’s is open daily from 12pm – 10pm (until 11pm Friday – Sunday). Skip Jack’s Seafood Grill, Bar & Fish Market is known as the best seafood restaurant in St. Maarten. It’s located in Simpson Bay, it’s right on the water and a local favorite. Skip Jack’s was completely wiped out in Hurricane Irma, but it finally re-opens in January 2019. The menu regularly changes here with the fresh catch and a blackened fish of the day. But Skip Jack’s has always been known for its fish & chips, mahi mahi is a staple, they almost always have fresh oysters available and landlubbers will love their famous giant steak. You can also purchase fresh fish and seafood in their fish market. What’s available for sale changes day to day. If you’re staying in an accommodation equipped with a kitchen and want to enjoy a night in, check out the selection at Skip Jack’s. This article contains affiliate links. When you book on Booking.com, Viator or TripAdvisor through our affiliate sites, we earn a small commission at no additional cost to you. Sounds like a great place to chillax and spend the day. Any hnikig trails? If not that’s okay, I’ll just grab a cocktail and make a day out of it.cheers! We stayed at a resort near Maho Beach once and I remember how shocked I was when I first saw those planes coming in! It’s been a long time since I was in St. Maarten so I don’t remember what other beaches I went to, but I’m in the mood for heading back there now that I’ve seen you pics. We used to go to St. Maarten every year in May. Oh how we miss it! Our favorite thing to do in our last day was always to hang out at Sunset Beach Bar and watch the planes until it was time to go to the airport. And the beach bar there has a terrific calamari burger. What a fun place to spend a birthday! The segways must be new since our last visit there. We did segways in Budapest and had a blast! St. Maarten seems quite interesting. Interesting to know that its only 37 square miles. Fly zone xtreme sounds like a lot of fun but not for the faint heated I suppose. Fly Zone Xtreme is definitely not for the faint of heart, Shalu. Stepping off the platform and trusting the cable and harness gets my heart beating every time. If I went, I would do number five and four first. I am a sucker for parrots and butterflies! Then you would definitely love the Butterfly Farm and zoo, Natalie! I’ve always been fascinated with butterflies too. It’s so beautiful to see newborn butterflies take their first flight. Love small places where there’s so much to see and do. St. Maarten looks beautiful and love that they offer Snuba. I’m a certified diver but realize it’s not for everyone and nice that people can still experience the ocean without all the training. Snuba was great because it eased my mind a bit about whether I would freak out submerged beneath the water. I definitely want to learn to dive! I do have questions about whether I can wear my contacts diving and I wonder if I’ll freak when I have take the mask off and put it back on under water to get certified. I think that guy was about 5 lbs. We got there late and he was the only lobster left. Tim definitely had to help me eat it! Hi Megan! Enjoy St. Maarten! It’s one of our favorite places. We recommend just renting a car. It’s very easy to drive on the island and most of the time you won’t even see other cars. Drivers are very laid back, so nothing crazy and very few roads are narrow. There’s basically one road that circles the island. Jennifer after numerous trips to St. Maarten over the past twelve years I always laugh when I hear someone say there is one road that circles the island. I am enjoying your blog and getting some good ideas on new places to go when we go back in May. I agree the day sail to Prickly Pear is very good but our favorite is still the Golden Eagle. May will make our 15th time to go out with them. That’s awesome, Larry! We really miss our annual trips. Glad to hear someone loves St. Maarten and returns time after time just as we do! Check our vrbo that’s where you can find what you’re looking for. We just booked one thru it! Small and much more personal and with a kitchen. Steve, my fiancé and I will be there October 2017 for our honeymoon! So looking forward to exploring the island. Any other places or things you suggest?? Especially for honeymooners? So glad I stumbled across this post! My family and I are going on a Disney cruise and stopping here! Glad to know we don’t have to plan ahead to participate in beach activities! Do you have suggestions on the absolute best places to hit in a day? Hi Melissa! Congratulations on your nuptials. Two weeks definitely is not too long. We used to go to St. Maarten every year and always found new things to do with each trip. There are a lot of great restaurants! 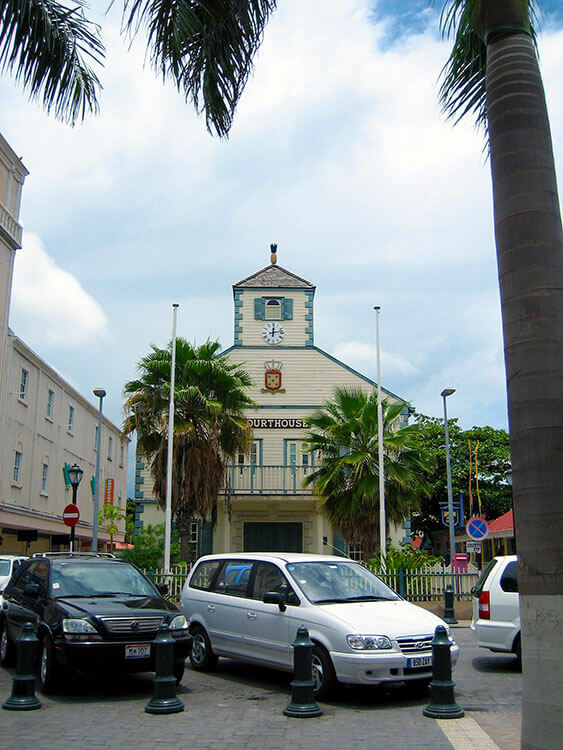 Some of the best restaurants are in Marigot and Grand Case. I recommend Le Belle Epoque in Marigot and California in Grand Case. Also love The Greenhouse in Phillipsburg, which has lobster on Friday nights. Restaurant Le Santal has award winning French cuisine and Restaurant at la Samanna Resort has amazing views in a very romantic setting. Many of the resorts have spas, though I’m afraid we haven’t used any. We felt completely relaxed with all the fantastic activities that we just never spent time at any of the spas. Hey Melissa, do you think St.Maarten is a good place to go to for two 24 year old men? Me and my buddy are looking for a good island to go and party but also go off the resort and do stuff. Do you know if a lot of young single people go to St.Maarten? We can’t recall a lot of singles, but we honestly aren’t in to the single, party scene as we’re a couple. There are definitely clubs and nightlife, particularly in the Maho Beach area. My fiancé and I are staying at a villa near Dawn Beach for our honeymoon. Do you know much about that area? Are there any areas that you recommend we stay away from (especially at night) from a safety perspective? We are renting a car, so will be able to explore the island. Also, do you have any hiking recommendations? You do have to be cautious in St.Marteen about theft. We stayed last January near Dawn Beach and a couple was walking at night home from dinner and they took their backpack at gun point. Unfortunately, the couple was from Sweden and their passports were in the backpack. I don’t recommend walking the streets at night unless you are in the bigger cities with lots of people around. And whatever you do, do not leave anything in your car because there are a lot of car break ins. That being said…use common sense and you will LOVE St. Maarten. We’re so glad to hear you really enjoyed your trip to one of our very favorite places in the world, Jennifer! St. Maarten is a great place to celebrate a milestone anniversary – congratulations on 25 years btw! The French side is so fantastic. It’s much less developed and touristy than the Dutch side. Grand Case is the absolute foodie destination on the island and you can really find fantastic restaurants there. Thanks for the recommendation for Rancho del Sol! We didn’t mention Maho beach in this round up of things to do, but we have it included on our favorite beaches list. It was always our ritual to hang out there for a few hours and to have calamari burgers at Sunset Beach Bar before our flight home. My partner and I are looking at possible places to get married. We would like a destination wedding that is away from the UK. My partner is from the Netherlands and I am British. 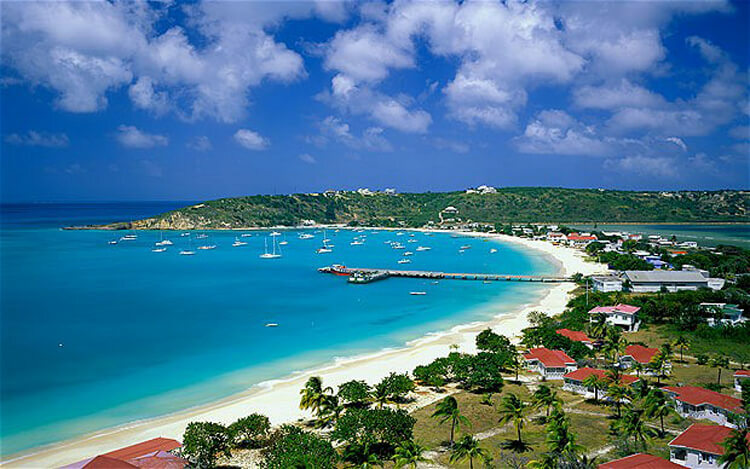 At first I was looking at Anguilla, but I worry if there is enough activities on this beautiful island. I like areas where I can do something new each day and spend time to relax. Then I thought of St Maarten. My partner used to live in the St Maarten in the NL so we thought it would be perfect. Could you recommend hotels and or villas, wedding locations etc for us to research. Congratulations Amaris! I agree that there probably isn’t enough activities to keep everyone busy on Anguilla. It’s not very developed, but has gorgeous white sand beaches. You can reach Anguilla in about 30 minutes by ferry from St. Maarten though, so you could get married there and relax for a day or so and then ferry back to St. Maarten. Maybe check out Cap Juluca in Anguilla or La Samanna in St. Maarten. I came across your site when looking for suggestions of things to do in St. Maarten since my boyfriend and I just last minute booked a quick trip down there before we both start our new jobs. We’ll only be there for a short time, staying at Dawn Beach, so I was wondering what you thought were the absolute must do activities. While we both love to lay around on the beach when traveling somewhere new we like to do activities. Also I saw that you recommended renting a car, do you have any suggestions for rental companies? Or will we be fine being able to find and get taxi’s since we’ll only be there a few days, I keep reading reviews of places about of people getting scammed when they return their car. My husband and I are leaving Sunday for our honeymoon. Your article is right on time. We’ll be there for a week! Congratulations Angela! You’ll have a fantastic honeymoon on St. Maarten. So happy I found your site!! We are going on a 8 day cruise and will be there September 2nd 2015. My husband and I are looking forward to beautiful beaches…..but want to enjoy a fun restaurant with local rum and music. Is there also good shopping that you recommend?? We are really excited to come there!!! Hi Michelle! So glad to hear St. Maarten is one of your ports. It’s one of our favorite places. How long do you have in port? You’ll come in to Philipsburg and there is a lot of shopping within walking distance from the cruise terminal. In Philipsburg, don’t miss the Guavaberry Emporium that we mentioned in this post. Another town we like for shopping is Marigot, on the French side. There are good restaurants in Philipsburg, but if you really want to experience the island and excellent local cuisine, head to Grand Case on the French side. You can find beach front restaurants, which of course have local rums, and delicious food. Grand Case is the foodie capital of the island! Hi! Am thinking of going to St Maartens with my (3) kids and was wondering if it will be a good idea. Is the island children friendly? are there any activities I could do with them while there? We are going in June July to Guana Bay Beach Villas on the Dutch side and will be staying there for 4 nights. Any suggestions on activities to do will help. Hi Kumar! Since St. Maarten is pretty small – you can drive around the entire island easily in a few hours – you can do a lot of the activities we listed here in your four days. We’d say not to miss the sailing trip to Prickly Pear. That is definitely a highlight. Enjoy! My wife and I favorite excursion is the Golden Eagle catamaran. We will be there for 2 weeks in May and it will be our 14th time to go out with them. Need a GREAT taxi driver ask for Nate the Great. Super guy and will do anything you ask. Tell him Larry and Connie will see him soon! Wow, 14 times. Sounds like you and your wife love St. Maarten even more than we do! Thanks for these great suggestions, Larry! Glad to here there are still great taxi driver, which taxi company is Nate with? Me and my wife will first timer,s to St Maarten and so looking forward to it. Thanks and I’ll be sure to tell Nate that yall are coming to see him! Went there last October as part of our honeymoon. Going back for 7 days this October bc we fell in love. We are staying at Mary’s Boon in a beachfront studio. Can’t wait to wake up to Simpson bay everyday. I was surprised to see you didn’t mention Karakters. We loved it there!!! Any suggestions for good bars/nightlife that’s not too crazy? We were in St. Maarten and St Thomas several years ago for a day on a cruise. We know St. Thomas has wonderful jewelry stores, actually our husbands bought both of us girls a ring. But if we go there to stay for a week, how easy is it to travel from on St. Thomas to St. Maarten and where would you recommend for activities and a little night life? Hi Annie! St. Maarten and St. Thomas aren’t very close together. There are direct flights several times per week and the flight is about 45 minutes, but the flights aren’t inexpensive ($500 upwards for a round trip flight). I’d honestly pick one or the other to spend the week. There’s a ton to do on St. Maarten and you can visit a number of neighboring islands with the ferry, like Anguilla, St. Barth’s and Saba. St. Maarten definitely has a lot of nightlife, so that would be a good choice if that’s what you’re looking for. And do they have the duty free jewelry stores like they do in St. Thomas? Yes, they do! St. Maarten has a ton of jewelry stores and it is tax and duty free. Looking at vacationing in St Martin next month. Would you recommend all inclusive or not? Any particular resort or hotel suggestions? Trying to plan a vacation is getting overwhelming. Any suggestions greatl appreciated. Darla my wife and I will be there for 2 weeks in MAY. Our resort is called Oyster Bay and it is right on Dawn Beach. We have been going there for 12 years and always enjoy it. They have a beautiful pool and there are good places to eat right out of the resort. Hope you enjoy the island! How did you like oyster bay? I’m staying there in November. Just booked Grand Case Beach resort. My wife, myself, and a couple of friends are staying in the Westin at Dawn Beach in the first week of June. When I travel, I like to see historical places, eat local food, and do things that you can’t do everywhere else. Are there any particular restaurants or places to visit outside of your top 10 posted in this blog. I definitely plan on doing a few of those. I just had neck surgery last week so I don’t know if I can do the zip line but that looks awesome. Thank you in advance for any ideas you might have and for the info you’ve already shared through your blog. Hi Ed, no it sounds like the zipline isn’t a good idea for you after a recent neck surgery. You really can’t eat bad food on St. Maarten. There are a lot of great restaurants! Some of the best restaurants are in Marigot and Grand Case. I recommend Le Belle Epoque in Marigot and California in Grand Case. Also love The Greenhouse in Phillipsburg, which has lobster on Friday nights. Restaurant Le Santal has award winning French cuisine and Restaurant at la Samanna Resort has amazing views in a very romantic setting. Pineapple Pete Restaurant in Cole Bay is great too. what a nice place to go. OMG! My family goes every year in December and we stay at Divi Little Bay. Amazing view and the snorkeling off the beach there is terrific; also offer scuba diving. Another restaurant to try in Grand Case is L’Auberge-simply fantastic. On the boardwalk in Phillipsburg try for lunch Taloula Mango’s. We agree that Bobby’s Greenhouse is a terrific casual spot with 2 for 1 Happy Hour. There is great diving and snorkeling in front of Divi Little Bay! There’s a shipwreck there that has a lot of reef life living on it. Thanks for sharing your restaurant recommendations too, Jacquelyn! Just finishing up a 10 day visit and this page has been our biggest source of info. We’ve done 5 things on here so far. Thank you so much. I would also add a snorkel trip on Scoobidoo to Prickly Pear to this. Times must’ve changed so I have to point out that Greenhouse is NOT 19.95 PER POUND, Nor does their website state that. We were there Friday the 29th, and 19.95 gets you a 6 ounce lobster, if you want a full pound it was around $40. Still very tasty, we also had the coconut chicken which was also excelent. Thanks for noting that about the Greenhouse Alan and Gioia! I just checked and it’s now lobster mania on Tuesdays for the $19.95 per pound. I’m glad you found all of this helpful for your trip and that you’re enjoying your visit. St. Maarten is one of our favorite places in the world. Your information will have me hiking, Kayaking, zip lining, and island hopping. Thank you so very much for all this wonderful information I have found in your blogs. So glad to hear you found it all helpful, Don! Enjoy your trip and celebrating your wife’s birthday. Saint Maarten is one of our favorite places in the world. Anguilla is fantastic! It’s easy to get there. The best way it to take the fast ferry from Marigot on the French side. They start at 7:30am and the last ferry departing Anguilla is at 6:15pm. It’s $20 each way. Alternatively, you can take a ferry from the Dutch side at Blowing Point but it is $130 round trip. No matter which ferry point you leave from, there is also a $5 departure tax and an $8 security fee. And don’t forget your passport. Once in Anguilla, you can rent a car right at the ferry terminal for the day so you can explore at your own pace. Just remember that they drive on the opposite side of the road, though we hardly passed any other cars. Take the water taxi in Marigot. Been a few years since we’ve made the 1/2 hour trip but I recall the cost at about 50 Euro. The beaches are amazing on Anguilla! 3: You can take the ferry over on your own and get a taxi to take you around. Speaking of taxi’s if you need one in St Martin ask for Nate the Great. We have been going for 14 years and he was the first one we met. We love him and his whole family. Actually had him and his wife stand on the beach with us 2 years ago when we renewed our 35th vows. Most of all Enjoy the island!! PS: If you go with Nate tell him Larry and Connie said Hi! Going to St. Maarten in one week for the first time. I want to thank you for all this information. I will be staying at Sonesta. Is there anything close by to do? I want to go snorkeling and/or swimming with the dolphins. Hi Darla, you’ll love St. Maarten! Sonesta is near Maho Beach and there really isn’t much snorkeling right there. That side of the island was badly damaged in a hurricane years ago, and that included the reefs and beaches. We hope you’ll be renting a car to explore the rest of the island! You can easily drive around the entire island in just a few hours – something we did multiple times on each of our trips. The best right off the beach snorkeling we’ve found is from a beach called Happy Beach on the French side. As for swimming with dolphins, you’ll have to take the ferry over to Anguilla to do that. I’m a fan of ziplining but my hubby hasn’t been yet so that’s high on my list of things to do in 2017 and this looks like the perfect place. On a side note, I can’t believe how low those planes go! So glad to come across your site! my husband and I will be going to St. Maarten the end of March for the first time. We’re active seniors and foodies. We’re looking for romantic things to do and love history. We’d LOVE suggestions! Well, I think this guide pretty much covers it with things to do! There are a lot of great restaurants since you’re foodies! Some of the best restaurants are in Marigot and Grand Case. I recommend California in Grand Case. Also love The Greenhouse in Phillipsburg, which has lobster mania for $19.95 per pound. Restaurant Le Santal has award winning French cuisine and Restaurant at la Samanna Resort has amazing views in a very romantic setting. Pineapple Pete Restaurant in Cole Bay is great too. I’m like everyone else…so glad I came across your site. I’ve been trying to find things to do that aren’t your typical top 10. I’m going for the first time with my wife to celebrate our 10 year anniversary. Is there car rental right at the airport? Any company better to rent from than others? Or would you suggest taxis throughout the trip? Lots of great suggestions for food on here, and things to do during the day, but where are some of the best nightlife places. I want to have fun, and feel safe at the same time. I don’t want to have to worry about stumbling into ‘shady areas or characters’ in the middle of the night. I’ve heard you can rent bicycles as well, would you suggest this? Keep in mind my wife will thoroughly enjoy any shopping we come across. Have you been to The Yoda Guy? Is it worth the time/money? You definitely want a rental car. Yes, they are available right from the airport and we always just went with the least expensive which turned out to be Thrifty each time. We’re not really in to nightlife, but Maho Village is like a Caribbean Las Vegas. There are plenty of bars, clubs and casinos to hit up. It will be very active there with all the people that nightlife, so it’s safe. Like anywhere, just keep your wits about you. Sint Maarten is small enough to navigate around the entire island in a few hours in a car, but it’s really not small enough to get around on bicycle unless you really like cycling. It’s about 20 kilometers from Philipsburg to Grand Case on the French Side to give you an idea. Plus, I wouldn’t ride a bicycle around once it gets dark as the island can experience some petty crime. We have not been to The Yoda Guy. It’s a small museum with Star Wars and other movie history. It is one of the top 3 attractions in the Caribbean, so probably worth it if that’s your cup of tea. We never really got in to Star Wars, so just not our thing. We’d rather be out diving and doing water sports. Thank you for all of your information Jennifer. What currency is accepted throughout the island, am I best to have different currencies for either side of the island? And if we rent a car, I’ve heard it’s easy to get around, do you know what it’s like to park everywhere? Is it easy to find parking, whether we’re at a beach, in one of the bigger cities or doing an excursion? And is parking free, or is there a fee most places I’ll find parking? (If there is a parking fee, is it just a machine? Would I need change?). Sorry for all the questions, just trying to alleviate some of those little things you tend to forget, and it sure sounds like you know what you’re talking about with the island. Paul the good ole American green back will cover all your needs on the island. Parking can be a pain on the island. Be sure and leave no valuables in the vehicle at any time. While we have rented a car several times the last few trips we just get Nate the Great our first taxi driver we met 14 years ago to take us and drop us off and pick us up. He and his family are great folks and will treat you right. If you go with him tell him Larry and Connie said hi! My girlfriend and I are headed to St Maarten in November 2017 for our first visit (a week). We are more laid back beachgoers. I read some of your suggestions. Any absolutely ‘don’t miss’ destinations? We are staying at the Sonesta Ocean Point Resort. For jazz, Karakter Beach Bar in Simpson Bay has live jazz on the beach. Axum Art Café in Philipsburg also has live jazz, but they are unfortunately closed until the end of August. We always went to Maho Beach the day we were leaving and would get lunch at the beach bar. Unfortunately, a tourist was recently killed there from jet blast when she failed to heed the warning to not hold on to the fence. There are changes being considered, including closing or re-routing the road there so we’re not sure of the current situation at the beach. But it’s a favorite spot since we love watching the planes come in. We don’t know Nate, the taxi guy. Another reader who also seems passionate about St. Maarten is always recommending him. What we actually recommend is just renting a car to get around so you can really explore the island. Car rental is inexpensive. Nate’s email is [email protected] if you want to contact him before you go to arrange pick up at airport. His number on the island is 522-5244 or 552-0031. Have a great trip and tell him Larry and Connie are looking forward to seeing him soon. The airplane watching is something we really enjoy for a few hours. It may not be as impressive as it used to be since KLM stopped bringing in the 747 a few months ago but the drinks and food are really good at the beach bar. Thanks for some great ideas! I’m heading to St. Maarten in about 3 weeks and I’m hoping at least some of these things will still be available after Hurricane Irma.